There really is no excuse for not making your own Halloween Costume - even the laziest of us can take a white sheet and cut out some eyes to make a scary ghost. Anyway, homemade costumes, even however crudely made are always so much more fun. And, who would want to pass up an opportunity to get the kids involved in the imaginative effort... all the more fun! You can make so many costumes from so little too. There is much you can do with a bit of cardboard, or paper plates, left over party balloons, old material, make-up, juice boxes, and thousands of other objects just laying around your house or garage. And, once you ween your older kids off of the store-bought variety you'll see that the ideas are endless. 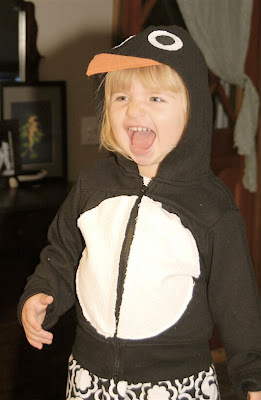 Jennifer and Soren in Maine sent us this delightful picture of their little girl AnaSofia dressed as a..... well..... as a monster... or is she a duck.... or a penguin - YES, a penguin!! According to Jennifer, though, the costume seems to be open to many interpretations! Jennifer tells us that she took a basic black hoodie and sweat pants as the base of the costume and sewed on eyes, beak, and a belly. She made the feet so that they could be easily tied with a ribbon onto AnaSofia's everyday shoes. Looking at the pictures of AnaSofia, she isn't really concerned what she is - she's just very happy to be in the costume and trick or treating with her Mom and Dad. How sweet does she look! As for Rhonda in Rhode Island she used material she found to create the costume for her son Lucas. 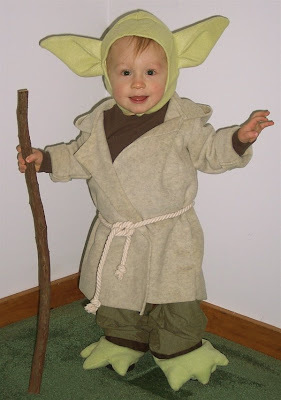 If you haven't guessed already, Lucas is dressed as Yoda.... except that his own face is much much much more cuter than old Yoda! We love the details on his costume like the delicate rope belt and the cane/stick. And, just that unique touch in the ears gives them that extra definition that says old, wise Yoda. He's one very handsome Yoda! Alex H in Washington DC sent us a few images of her daughter Io's costume from last year and this year. Last year, as you can see, she went as an ugly monster. Alex tells us that she was a sort of cross between 'Big Toe' and 'Tray' - but either way you cut it, that beautiful smile makes her more of a cute blue monster rather than an ugly one! This year, Alex says she went for a Wild Thing, as in 'Where the Wild Things Are'. The costume was inspired by a gift from Io's Abi (Alex's mother) of bear slippers. Alex said she had to tone down the outfit a bit because Io was a bit afraid of the original idea which was going to include maroon shaggy fur. We're glad she was able to keep the horns though! 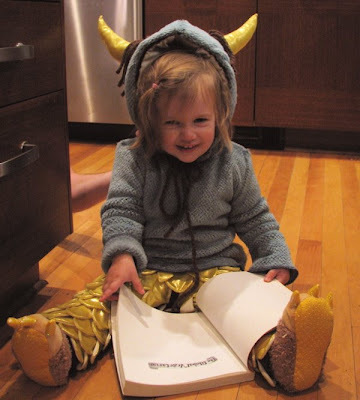 She's the cutest thing we've ever seen from the Wild Things! Alex tells us that she detailed the legs with scales made from gold material (the same used on the horns) she scalloped and sewed into strips that adhere to the stretch pants (about 10 strips per leg). And, the tunic is made from polar fleece. That was not an easy solution - but that extra effort surely paid off - the outfit looks wonderful. And, the good thing is that Io doesn't seem to be frightened in the least! One very pretty Wild Thing! And, as we told you - our little girl, upon seeing her older brother's robot/Transformer costume decided she wanted to be a robot too. So, we suggested she go as a robot/princess so that all our bases our covered. In a flurry of late night activity we took our the card board and tape and piping.... and... well.... voila! Our princess is now robotized! Thank you to all the parents who sent in their costume images. If you'd still like to share yours with us, we'd be glad to see them all and perhaps do a future posting sharing them with all our readers - just send them to Karim@nonchalantmom.com with the title 'halloween costume'... A VERY SAFE AND HAPPY HALLOWEEN TO ALL OF YOU !!! It's just a little idea that I have...but wouldn't it be great to have more tea shops around (maybe even instead of all of the coffee shops...whatch out starbucks!) instead of coffee on every corner, think about it, they could be these quiet little enclaves where the brewing of tea (it just takes it's own sweet time) becomes the issue. you know what I mean, not so far as a traditional Japanese green tea service (although...how chic would that be!) but a quiet traditional tea shop! I found tea when I had my second baby, three years ago, with all of the do's and don't of pregnancy coffee is off limits. One night when we were out for dinner in New York in my favorite restaurant, Omen (On Thompson between Prince and Spring) I ordered Adzuki bean tea and it was this rich smooth blend of tea (organic) that they import themselves from Japan, it's delicious! This started my adventure, I asked them if I could sell it on my website and when I finally pinned down the owner to ask him, he politely declined. (darn!) In the meantime, I enjoy it when I am in New York and at least that's something! Back at home, I found an online tea shop called Samovar, they are based in San Francisco and they make and sell terrific organic teas! There is also Hampstead, which you can find at Whole Foods. I think one of the most difficult things is finding good tea that you really like so once you get that part done you can experiment and find great things that you will enjoy at different times of the day. Twig tea/Kukicha - this is really the best, wonderful during pregnancy as well, it is high in calcium and antioxidents. The taste is very smooth, light and woody, you basically boil the twigs in water (you will find your own favorite proportion), and you can re-use the twigs up to three times (some people use them even longer). the first time you cook them just boil for about 2 minutes, then the next time 5 mins and then about 8 mins. I make a big pot in the morning and then put it in a thermos and drink it all day long, this makes a wonderful iced tea as well. you can add an umeboshi plum if you are not feeling well and this will help you to be stronger and help to calm your stomach. My kids like Kukicha too, but they mostly like it cold...(and I like that is high in calcium!). Kukicha also makes a great drink with your food (let everyone else drink wine!). MU tea - this is a wonderful winter tea, it warms you up and it really energizes you. Mu tea is a blend of about 8 herbs and spices (I'm not comfortable tell you that this is ok during pregnancy, but I drank it). You can find this tea in the Eden section of Wholefoods or any health food store. Lotus root tea - this tea is great when you have a lot of mucus, if you eat a lot of sweets or after a bad cold. Lotus root tea actually dissolves mucus. If I know that I am having a problem I like to drink a cup a night just before I go to bed, you will notice results right away. Lotus root tea comes as a powder, it tastes kind of like a broth. Ginger tea - I just add ginger to my Kukicha tea to warm me up in the winter. Green tea - This has so many healthy attributes, and I think that you all know most of them. It's a delightful tea, but I don't think it's so good to drink when you are pregnant. Genmicha - this is a blend of Kukicha and toasted brown rice (it almost looks like popcorn) this is a really tasty flavor and a little more complicated than the Kukicha tea, this is also one of my favorites and like Kukicha it is good with food as well as alone. The above are all Japanese teas that are available here and are delicious. I am also a big fan of English tea as well and there is nothing better than a nice cup of black tea in the morning. My mother in law who is English thinks that I am destroying the tea because I don't drink it with milk or sugar, but I love a nice cup of Earl Grey with honey... you will become hooked! Earl Grey - this is a black tea that usually has Bergamot (I love it! ), it almost has a flower-y taste that is lovely! Organic Orange and Ginger - this is a great tea for the evening, to keep you warm from the inside! Samovar Moorish Mint - this is another nice tea in the evening, but make a pot because once you start to drink it and everyone else smells it, they will all want a cup! All of the teas that I have listed above also make for good drinking all day long, I make a pot in the morning and then later in the day I take some apple cider or lemonade and mix it with my tea and ice and it's delicious, this is great when you are pregnant and everyone else is drinking wine, you can have your own special drink! 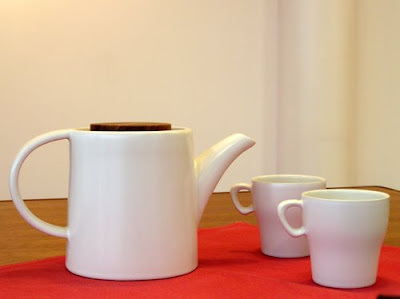 So this Holiday, get yourself a beautiful teapot that you love and start your tea adventure! Good luck with your tea adventure and then next time you visit France don't miss the Mariage Frères Tea room in Paris, and then when you come back, let's open a tea room together! Veja is really one of the most amazing companies I have worked with so far, they are made up of a group of talented and thoughtful young people, who boldly ask..."is another world possible? Pollution, black tides without responsibility, destruction of the ozone layer, exacerbated individualistic consumption: how long can we go on like this? How long with the survive to our lack of empathy?" --why don't we try to change the world, even a tiny little bit. 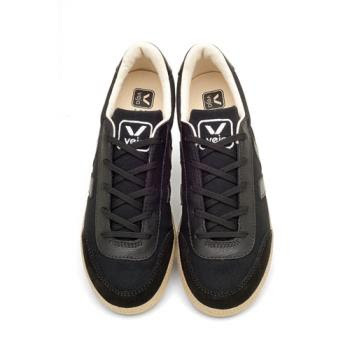 You can see in their statement that the veja project is well thought out and includes a clever bunch of people behind them, because not only do they have the production chain covered in a fair trade way, but their products are the coolest sneakers I have ever seen! Production of each of the components is totally fair trade AND organic...this is not an easy task, the organic cotton is from the region Ceara, in Northeast Brazil where they work with local farmers, the fair trade latex is harvested in Amazonia, and in the assembly the labor conditions and wages are above Brazilian national standards in Southern Brazil near Porto Alegre. Because of the premium paid for wages and latex, Veja is working on developing a social project which is to start an in-house education program for the remote families that would usually have to walk hours to get to the nearest school. 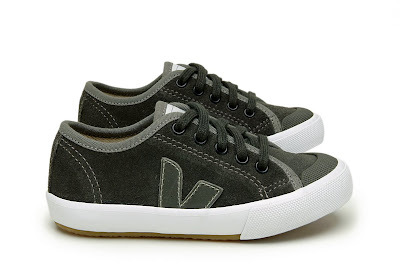 Please don't hesitate to visit the Veja website to find out more and see more of their production project. The design is by a Brazilian shoe designer and the founders of Veja, they are inspired by the old-school Brazilian volley trainers... whatever they are I love them, I ask them in just about every time that I talk to them if I can please sell the adult collection, but no, they are more concerned with doing it right and not expanding production until they are ready, so for now...only our kids can style their way to a new world in their Veja sneakers. I say that just wearing them will make you feel better about the world! Thank you Veja, for teaching us all how to do it right, well and honest! 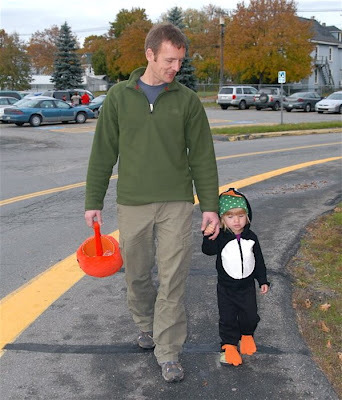 the NonchalantDad: Do-It-Yourself Halloween Costumes! Last year at a Halloween Party for our son's school I counted numerous store-bought outfits and lamented a time, when I was young, when outfits were simpler and a lot more fun. Of course, like nearly everything else, Halloween has become a big commodity and you will find lots and lots of costumes off the rack from all your favorite cartoon, video game, and celebrity sources. It's enough to make you want to throw in the towel - and many parents have done so. But, let's remember that this is an occasion for children, and shouldn't be an inconvenience or pain in the back side. We, as parents, told ourselves then that this year we'd make more of an effort to bring back some personal value to the Halloween tradition - something lost in all the hassle and parties and demands. So, one way in which to do this was to create our own costumes - build them ourselves - everyone involved. That's not a bad idea when you have a 3 year old who will pretty much wear whatever costume is presented to her. But, when you have a willful 7 year old who shouts out 'Transformer' when you ask him what he'd like to be... well.... the game is a little different. What we did is one part bold-faced lie (for a good cause!) and another part adventure. I told my son that there were no Transformer outfits to be had - that the robot pieces made it to hard to make them in a factory. The only way we could have a Transformer outfit was to make one ourselves! But, if we did make one ourselves, we could pretty much make whatever incredible thing we could perceive in our imaginations. "How awesome would that be?" I said. We gambled that he would like the adventure, and sure enough, once we all sat down at the kitchen table and started drawing pictures of the outfit and arguing over whether there should be a mega-shield that lights up over the eyes or not, or a jet-pack-spewing-fire thing attached to the back of the robot outfit, he was hooked. The idea that his 'Transformer' (we preferred to call it a robot) outfit could be made pretty near to his interpretation of what it should look like, he was excited to make it himself. And, once our daughter saw how fun the process was, she was hooked too. We had her trying to draw Princesses and Doggys - all colors, shapes, and sizes. The best thing we did was to start with the table full of drawings. Our son, and daughter, were off and running with wild imaginations as to what we could possibly make. They both conceived of wonderful and fantastical things - our daughter mainly scribbling stuff but talking wildly of what she saw! Then, we slowly but surely whittled the ideas down to more practical means, excitedly arguing over whether or not to have a Mega-Shield that lights up and comes down over the eyes (impractical), or whether or not to have a fire-spewing jet pack attached to the back of his outfit for easy escape (practical - taking into account what his imagination would do rather than what the jet-pack would actually do). As for our daughter, she got in on the idea of what kind of princess she'd like to be - a pink one, a purple one, a green one, and so on. This information we relayed to Nana (I'll explain in a minute). As for a doggy, we worked on what kind of doggy she'd like to be: big ears or little, spots or not, long tail or short, etc. Basically, you tailor fit the process to the imagination of the little one's age. Whatever it was, it was working. No longer was there a desire to simply go out and buy an outfit. We were going to make our own super cool robot Transformer outift! We were going to make our super pretty princess and doggy outfit! Of course, we are the type of family where there is a grandparent involved. My mother, the kid's Nana, has always been keen on making an outfit for the kids. She's great with the traditional ones. So, not wanting to hurt her feelings and have her involved, even though she lives thousands of miles away, we encouraged her to go ahead and make an outfit too. After all, we reasoned that there would be a few parties leading up to Halloween and, our daughter especially, wouldn't mind a change in costumes. So, we relayed the info to Nana regarding the Princess outfit. And, between you and I, if that didn't work - well, Nana would be happy just to see a photo of the little one in the costume... so we couldn't lose. And, of course, if you can't or won't have time to make an outfit for the kids, then at least you can go to the effort of making the drawings with the kids and then farming out the labor to a relative or friend. Either way, the kids are involved! And, that is what's important. Next, we engaged in the challenge of quickly rummaging through our storage shed for material that was not used in prior building works. Mostly, we were in search of cardboard, piping, etc etc.... The search created excitement too. Each item that was found, or picked up, was presented with a comment like "..oh COOL, we could make a sword-arm-guard from this!!!" It was the kind of excitement and bonding I was hoping for - we were having fun. Even our little girl was starting to want to be a princess robot.... hmmm! Now, whatever we couldn't find in the storage shed we went out and found at the hardware store. I had told my children that I didn't want to buy a bunch of stuff that we couldn't recycle for other projects, nor waste money or materials buying stuff that would only go to wasted. In the end, considering my son's robot-Transformer outfit, the only thing we'd not possibly use again was the tape and a plastic grate that we used for his face mask - but even that we could recycle in the plastic bin. As for our daughters outfit(s) we could possibly hand those on to other kids in the future - another good idea alternative to just buying an outfit of the racks. The ingredients we sought for the Robot were simple: Silver tape, plastic piping, silver conduits, a disused plastic painting tray turned upside down, a small metal air vent (attached upside down for collecting candy in his 'tummy'), cardboard, a purchased plastic drain grate for the face, and one canister of silver spray paint. It doesn't take much - especially once you engage their imagination. After dinner, the other night, we sat down as a group with scissors, tape, material, Halloween music (optional), and general excitement and slowly but surely - in the space of a few hours - concocted some strange looking stuff. The kids were having fun as each piece of their costumes was assembled and in the end our little girl was running around in her doggy outfit barking at everyone and our son was standing in front of our full length mirror muttering all sorts of Transformer lingo to himself while turning on and off the little light we attached to his belly. We had succeeded in returning the occasion of Halloween costume making into a family gathering.... and what a laugh it turned out to be! Now, with home made costumes there are some imperfections. For one thing, our little guy couldn't function properly or easily for long periods in his costume. After a bit, he had to take off his mask at the school Halloween party (he also grew a bit intimidated with all the other kids coming up to him to see who was inside the robot) because it got a little claustrophobic. And our daughter's crown kept flying off every time she jumped with excitement. This reminded me of the time one of my older brothers dressed as a home made Jack-the-Box and was unable to operate easily while trick-or-treating in the neighborhood and was knocked off a porch by a door opening.... a big box with a dangling head all caught up in the bushes! 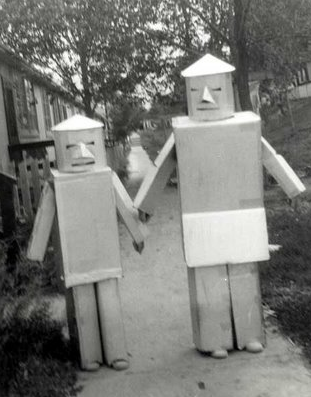 But, all in all the kids were loving it and we vowed then and there that we'd try this out every Halloween to come.... until, of course, the kids get embarrassed of us! And, the latest? Now our little girl now definitely wants to be a robot too! So, we are thinking we will make her a little cardboard robot outfit and somehow incorporate the princess dress or doggy outfit over that... his and her robot/Transformers!!! Here we go!!!!!!!!! HAPPY HALLOWEEN! the Guardian Online from the UK I saw her interesting photos. Caroline says that she spent the last year searching for a child from every country in the world that resides in the UK. Apparently, from 192 countries she was able to find 187 and interview/photograph 185. That's not a bad success rate. There are children from just about every conceivable location on the planet - even from countries many did not even consider. But, Caroline has found them and brought them to us in pictures. 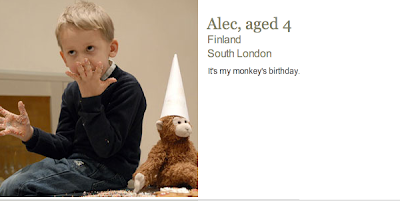 As well, each picture is accompanied by a quote from that child - some of them revealing and others basic - but all of them compelling nonetheless. It reminds us that the world is indeed a small place and that children everywhere, regardless, are much the same in spirit! If you reside in the UK then you should be able to find it in your last weekend issue of the Guardian Weekend Magazine. As well, in December you will be able to view it on Channel 4 television. As well you can see more of her work on her website at www.carolineirby.com. The children in the project range in age right up to teens. But, it is the younger ones comments that are all the more insightful and sometimes funny. My faves are Mounira (aged 6) from Morocco who says "My dad is in Syria coz he's got loads of wives." And, then there is Jaime from the nation of Sao Tome who says: "...we don't have computers and people are healthy because we eat all the fruit and we don't have crisps (potato chips)." Of course, there is William from Sweden (aged 8) who has to sing a song about himself! Love it. Happy and sad, there is a whole range of responses and photos to peruse. You should check it out while you can. I'm sure it wasn't an easy project to organize or to photograph.... but I'm glad she did! Recently I received an email from someone who was a bit irritated that I would send an emailer out in this difficult and unsettled economy - she was mostly concerned about the price of some of the items on Nonchalant Mom. Believe me, I listen to NPR all day long and I am highly aware of what is going on with the economy. But I also feel that this is a very important time to continue supporting local artists, designers and generally crafty people! It is just this type of economy and general fear that can make a lot of these small and creative groups just disappear altogether. One of my favorite collections has just closed it's doors, when I started Nonchalant Mom in 2004 one of my favorites was Paulina Quintana, she made these great colorful t-shirts, I loved them and sold them like crazy! it is so hard to see someone so talented close down. I started Nonchalant Mom in 2004 because I knew there were collections that I had access to in NYC and elsewhere that I wanted the whole world to know about. It was just my intuition perhaps, but I figured that many other parents would love to dress their kids in something unique and often hand-made with organic clothing whenever possible. Believe me when I tell you that Nonchalant Mom is not out to just make a BIG BUCK and that we are certainly not interested in following the usual pattern, my motto is that we are just trying to make our monthly mortgage, just like most of you. I think this is a time that we should support small companies, but I think it is part of a bigger picture that is a way of life. Because the economy is difficult now, I hope that everyone doesn't just start running out to the average Walmart of the world...this kind of retailer is not fundamentally supporting our country and all of its great potential. I think that if you are necessarily worried over spending your money I would suggest doing what I have always advocated: buy less and buy more consciously, trade basics and hand-me-downs with your friends, start sewing and make some things yourself. In essence, be more creative than just thinking I need to buy more really cheap clothing for your kids.... Many of the things we sell here at Nonchalant Mom are made to last, and not to just throw away - they are items that are not ordinary. They are things that you'd be proud to keep or to give to close family or friends! I am not about to dictate what you should do, but this is a time to look at making the right choices and supporting smaller businesses. It will make our society much more interesting if we support the little guys that are making things at home or in small studios or workshops, here in the USA and abroad. What we want to teach our children, even with the things we buy for them or have around them, is very very important, my dad used to instill the importance of being conscious of where you are spending that dollar and who you are supporting, because it means a lot. The message is important - and that is why I started Nonchalant Mom - for my kids.... and yours! Be right, be honest and this world will be a more friendly and capable place! (also, eat better food and it will help too!)..ha!!! In the coming weeks I am going to make more of an effort, through my blog, to present to you the face of many of the small companies that I deal with, so that you too can see where the heart of our society really should be focused. The emphasis should not be on cheap and mass produced items - it should be on well-made, stylish and ethical items first and foremost. It is the reason we are in business and it's what we believe in - I put so much effort into searching for unique things for Nonchalant Mom! I can't tell you how many times, as a designer myself of Nonchalant Kids, I have been tempted along the production line to cut costs here and there just by using cheaper quality products or utilizing cheaper production facilities, it is missing the whole point of being in business. And, I think it is one of the greatest things about the internet - that we can bring such unique things right to your front door wherever you might be located, and to that end it is such a great resource for a young designer. You are what you eat... and you are what you wear... who said that!? lasagna... just the way you like it! cook pasta drain and run cold water over it. in a large pan sauté onions in olive oil, add garlic (chopped), chop up Kale and add when onion is cooked. add tomato sauce, and diced tomatoes and tomato paste, then add salt, pepper and oregano and let cook for a bit. spread a tiny bit of olive oil in a casserole dish, put a little bit of sauce in the bottom so it doesn't stick and then lay in your first layer of pasta, spoon on a good healty layer of your tomato sauce, sprinkle both cheese and then cut the tofu into large thin slices and lay them on the top (then put just a bit of sauce again so the flavor goes into the tofu). 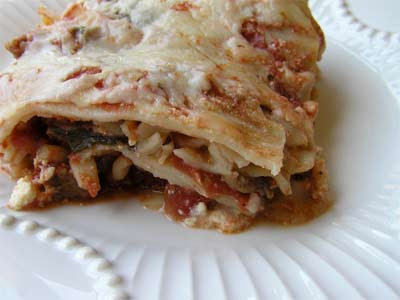 Now lay out the pasta again, sauce again, and cheese again and I usually put a bit more mozzarella cheese on the top. put in oven for about 20-30 mins on 350 degrees. good luck and good eating!! you will love it! I have seen these charts in various co-ops here and there, now and again. And every time I see one of them I tell myself to take down the contact info and get one (or some) for my own quick reference in my own kitchen. The appearance is fun and quick, as if you sat down and sketched out your own guide. Apparently, this was the case when Liz Cook first developed her first guide some 15 years ago when her son was a baby and her interest was in creating a quick reference for raising her son on an animal free diet. Since that time Liz Cook has developed a small series of laminated reference charts. 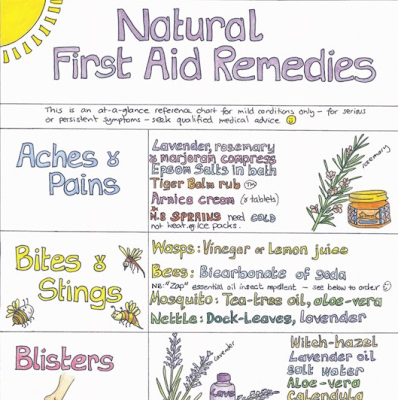 My favorite chart is pretty much the Nutrition Chart, but I also want to get the Natural First Aid Remedies Chart and the Natural Cleaning Solutions Chart. They are the kind of thing that gives a breezy overview to the kinds of things that always nagging at you - the things that you know you want to involve yourself more in, but sometimes put on the sidelines because there isn't enough time to reference each and every piece of information when it comes to healthy living. 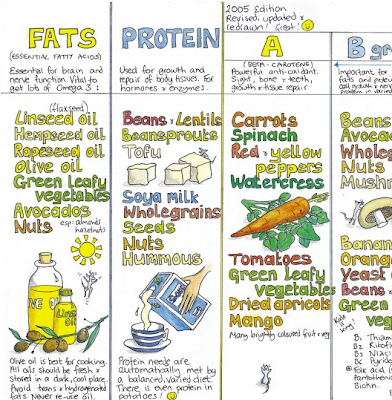 The charts give you just enough information and act as a check list when looking for recipe items or helpful hints. And, they act as an information catalyst for delving in deeper when you want, or need, to get even more information than can possibly fit on the charts. If you go to her website: www.lizcookcharts.co.uk you will see that she is located in Brighton, England. However, it appears that there should be no trouble purchasing one for delivery elsewhere in the world. Pin them to the wall, attach them to the refridgerator - put them where you'll benefit from quick info while cooking, or cleaning. 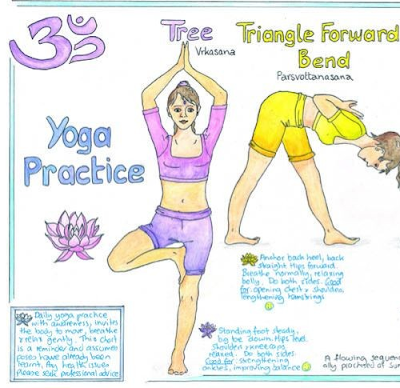 She even has one that concentrates on Yoga poses (based on the principles of Hatha)! For those of you with dogs there is a new chart called You and Your Dog - which I might consider as well since my kids are now interested in us getting a dog. I have found the guides useful when I see them at the store - but I need to get them for my home. You might want to do the same. Perhaps we can speak with Liz about something special for Nonchalant Mom's Tips and Info section! I think they are fun, easy to use, and a great start if you are not familiar with the particulars presented in the various charts. And, though I haven't seen the book that she has produced called 'So What Do You Eat?" 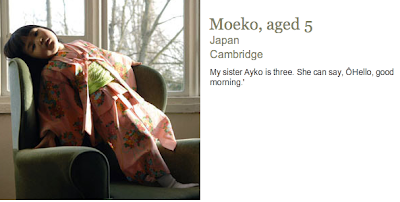 - the idea of a book that takes her concept further sounds delightful. I suggest you visit her website for much of what I can tell you here. Meantime, I suggest getting one.... or two.... or three! The more ammunition in our battle to do good for ourselves and the environment the better. We as a family are not big red meat eaters. But, like many people, I like a good steak. And, if you are concerned where your steak originates from, like I am, then you are interested in your beef coming from a reputable source. Much of the cattle that is used for steak is most often fed corn or grain. Apparently, cows are not meant to be consuming the stuff. Cows, by nature, are grazing animals and prefer to eat grass or other leafy plants. This is what their four stomachs were built for – to break down the fiber associated with the greens. So, why mess with nature? Because, it is more convenient and supposedly more conducive to a year-round supply being met cheaply – or at least cheaper than the grass fed animal. And, as I was reading lately, that is a bit of a shame when you consider how much more stress on the environment a feedlot animal creates. And, a cow that grazes in an open green pasture produces a better quality meat – full of healthier fatty acids that have been identified as an effective cancer figher. A grass fed meat is also full of Vitamins A and E. And, as I just read, it is one of the few land-based protein sources whose levels of omega-3 fatty acids outrank the omega-6 variety. Omega-3s are said to help prevent heart disease, fight depression, and improve brain function (which when you have small children, can be a proven asset!). Though not widely available in the USA (as much as we might like to think) grass fed beef is becoming more popular. About a year or so ago the USDA Agricultural Marketing Service cleared up some apparent loopholes when it issued new standards for grass fed marketing claims - standards that clearly defined the meaning of 'grass fed'. It is reported that Niman Ranch – the name almost synonymous with the production of a natural meat product – used to feed its cattle some grain near the end of the process of rearing the cow for slaughter. (This method produced a well-marbled meat with a traditional corn-fed taste that people have long been used to). Well, even Bill Niman is not the rancher he once was, as is reported by the NY Times. He now concentrates solely on feeding his cattle grass. He didn’t come to the decision easily though. He resisted the argument that a diet of corn was ruinous to a cow’s health and the environment. Now, Bill Niman is no longer associated with the brand bearing his name. He has struck out on his own and is pushing in new directions when it comes to the type of meat we eat. Keep you eyes and palate peeled on the next big thing: Goat Meat! It could be giving Lamb and Chicken a big run for your money! 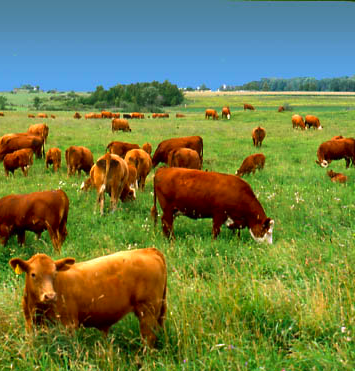 Now, where we live it is not extremely difficult to find a grass fed meat source. In fact, we have a few choices in Rhode Island. But, if you do have a problem identifying a source you might want to consider purchasing your next steak from online. Some suppliers can even get you your grass fed meat by the next day. I haven't checked into that yet – but I just might consider it. Why not? Just search ‘grass fed beef for purchase’ on your computer and see what comes up. But, make sure it is really up to the standards that are applied. So, if you are continually concerned about what’s in your food, or where it comes from, keep the option of a grass fed steak on your list next time you feed the family red meat. Soon, there just might not be any more excuses left to eating the commodity meats reared with grain and confined to feedlots! And, here’s another interesting fact in case you are put off by the whole subject: Bill Niman’s wife Nicolette is a strict vegetarian!! I met katherine from wovenplay a couple of years ago, and I still remember her booth at the bubble kids trade show in NYC, I stopped dead in my tracks, wandered through her fantasy land (spent some time in her booth) looking through her positively organic hand-made really beautiful creative playclothes and I have wanted to share her wonderful things with you ever since. Wovenplay will help your kids to rediscover the long-lasting art and imaginative play of childhood dress-up. These clothes have truly sweet hand detailing that katherine works on herself, and I think that I am busy... try sewing, dying, printing, sewing and then all of the really wholesome trims and did I mention all of the hand stitched details, I tell you, she is one talented woman. Saturated with color and texture, wovenplay's collection intergates natural and organic fabrics. hand-screened prints and artisitic, enduring finishing. styling is streamlined and modern for free movement. espressive play and imagination. 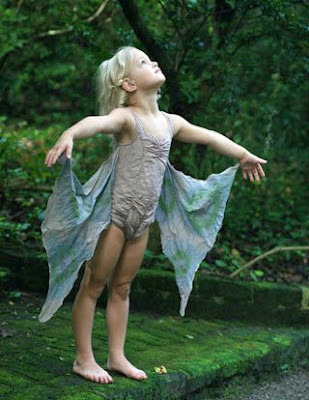 I think that there is nothing better for your kids than to hand down wovenplay's imaginative playclothes. Katherine has shared this deliciously fun recipe for dutch pancakes and rasberry coulis, they puff up huge and crazy in a pie pan when baked, and they taste super! they are fun and easy for kids to make with your help! Preheat oven to 425 degrees. Mix ingredients lightly. Melt butter in pan. Pour in batter. Bake 15 to 20 minutes. Remove, add fresh strawberries or raspberry coulis and sprinkle with powdered sugar. In a medium saucepan over medium-high heat, bring raspberries and sugar to a boil. Reduce heat and simmer, stirring occasionally, until mixture starts to thicken, about 15 minutes. Press mixture through a fine-mesh strainer, using a spatula to extract as much liquid as possible. Discard seeds and skins. Stir in 1 tsp. lemon juice. Taste and add more sugar or lemon juice if you like. Serve coulis warm or at room temperature. as soon as I make these I will share a photo...or if you make them yourself take a photo and email to me!! they sound super delicious! I recently came upon this article on Treehugger I think it's exactly what we all want our schools to offer and finally Oregon is stepping up and doing it! We should all try to do our part for our schools so that our kids get the best quality food. The Harvest of the Month Program features an Oregon grown product on the lunch menus of participating schools on the second and fourth Wednesdays of each month. The program is made possible through a partnership between Whole Foods Market and Ecotrust. Ecotrust is a nonprofit that establishes and maintains relationships between farmers, ranchers, and fishermen and restaurant chefs, grocery retail buyers, and other distributors. Its mission is to connect small sustainable farms to their customers, keeping demand high for the best seasonal offerings in the area. From kindergarten on through high school, kids at schools in the program get to enjoy fabulous seasonal favorites like local cucumbers, sweet corn on the cob, parsnips, cabbage, potatoes, pears, radishes, and asparagus. Eighty-five schools in the area currently participate in the program. Combining locally grown goodness into homemade meals shows kids how delicious local produce is in comparison with the vending machine monster found at the other end of the cafeteria. 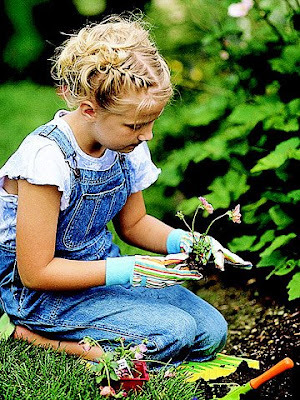 After all, getting them started young is always the best way to instill green values in your kids. Below are some of the awesome local farms chosen to be a part of the program. Each participating farm uses sustainable farming practices without chemicals or pesticides. And they all work hard to keep their impact on the planet minimal. As the program continues to grow, additional farms will be added to the roster to give the kids as much variety as possible. The Harvest of the Month Program shows kids the benefits of using small local farms versus mass producers, which can strip foods of their nutritional value and taste, harm the environment, and put scary additives into our food supply. thank you very much to everyone for all of your really sweet comments about my nonchalant kids collection for Fall 2008. I am very pleasantly surprised at the amount of support from everyone and tons of emails about the fit (it seems to be overwhelmingly good!) and comfort of the collection, and we have sold much quicker than I had thought we would! I have also realized that the "favorite pants" are not only our favorite but everybody's! yay! we have even already sold out of a few sizes...but there is certainly enough to go around! we really love it too and I can't tell you how fun it is to send my kids off to school in nonchalant kids! So thank you and we are now hard at work on the Spring 2009 collection, very cute too and a few more surprises! so stay tuned and keep the emails coming in, we listen to all of your comments and they help us improve the fit and quality of Nonchalant Kids! mastitis and engorgement--whatever it's painful! I had a big problem with engorgement and mastitis when I had my second baby, a girl--she wasn't as hungry an eater as my son and therefore would only eat from one side each time...ugh! so there I was with these GIANT breasts and this little tiny eater of just one side at a time. Which led to painful engorgement far too frequently...I think in total about once a month. The first time I got it we were traveling, and I think this is typical because, if you are just beginning breastfeeding you may not notice this in your stupor of tiredness but breastfeeding is really a lot of work for your body and it does tire you out in addition to the frequent sleepless nights of breastfeeding and general taking care of a newborn. So traveling can add an extra level of stress and just a plain worn-out feeling which can easily lead to engorgement or mastitis, in this case it had lead to mastitis (I think that mastitis can also come from a bacteria in a babies nose of some sort...but however you get it it's painful!). Also, typical to when you are traveling is the issue of no doctor, not much on the internet, and it's hard to diagnose with your doctor over the phone without them seeing your breasts, which is why I am writing this. What you really need to remember is that you need to catch engorgement before it gets painful and troublesome. The first thing to do is to try to stay relaxed and remember to rest as much as you can, get in the shower and let the hot water massage your breast and then also massage with your hand, you will almost be able to feel the lump and just keep massaging on it and around it with the hot water running on it. When you get good at this massage you will almost be able to feel when you massage it out....then breastfeed immediately afterwards, this will loosen things up. I think that the cabbage trick works really well and feels so good on your breasts, you take a piece of cabbage and put it into your bra or top and just sit back and let the coolness soothe your breast and relax you a bit. I also think that Bachs rescue remedy can work if you are stressed out and having trouble relaxing. I really believe in la leche league as well, they are a terrific source of help while breastfeeding and all you need to do is find a group meeting nearby, they also have local numbers that you can call if you are having a specific problem and can't wait until the next meeting. And I must say that there is something really reassuring about sitting around with a bunch of moms breastfeeding and talking about breastfeeding, especially if it's your first time around. good luck and please share and remedies that you have with other moms by making a comment! ps. I just remembered something else... my swedish cousin gave me these pads that were thermal to put on my breasts to keep them warm, it's important to keep them warm when you have engorgement trouble, so I would just put these pads in my t-shirt to help keep my breasts warm in the winter.